When police officer Carter (Aaron Poole) discovers a blood-soaked man limping down a deserted road, he rushes him to a local hospital with a barebones night shift staff. As cloaked cult-like figures surround the building, the patients and staff inside start to turn ravenously insane. Trying to protect the survivors, Carter leads them into the depths of the hospital where they discover a gateway to immense evil. 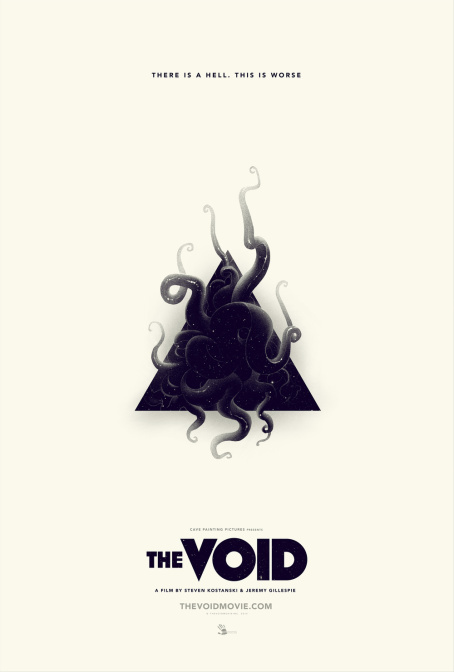 The Void,” is a lively, layered throwback to the days when splatter auteurs like John Carpenter, George Romero and Lucio Fulci ruled the drive-in. THE VOID isn’t a film that holds your hand. It isn’t shot through with expository monologues to make sure nothing goes over your head. It isn’t concerned with making sure you know more about the story than the characters experiencing it. But (and this is crucial) it never feels like the filmmakers themselves are unaware of the finer aspects of the mythology they’ve built. The film commits, wholeheartedly, to that mythology. It builds a dense, convincing vision of hell on earth with style and ease.